We always had plates of Christmas cookies around the house during the holidays which my Mom baked during the weeks before so, of course I had to call her to get recipes for some of my favorites to bake this year. These candy cane cookies were one of the recipes I asked for but she couldn't find it. I remember them being similar to a sugar cookie but with peppermint flavor so I figured I could probably figure something out on my own. I used the basic sugar cookies recipe from the Better Homes & Garden Cookbook adding peppermint flavor & then splitting the dough to make the two colors. These came out exactly as I remembered so my guess of using sugar cookie dough was right on. I'll admit they are a little tedious to make but they look so cute on a cookie tray. If you've got kids get them to help you roll out the dough "snakes." Put the butter & shortening in the bowl of an electric mixer & beat on medium-high for 30 seconds. Add 1 cup of flour, egg, sugar, milk, baking powder, peppermint extract & a dash of salt & beat until combined. Add remaining flour & beat again. Divide the dough into two even balls about 12 ounces each. Wrap one ball in plastic wrap. Return the other ball to the mixer & beat in enough food coloring to turn the dough red (it can take quite a bit to get a good red). Wrap the red dough in plastic wrap. Chill for 3 hours (or cheat like me & freeze for 30 minutes). Preheat the oven to 375 F. Cut a little of eat color of dough off to work with & return the rest to the fridge. Roll each color of the dough out into "snakes" about 1/4-inch thick. Cut them into 5-inch lengths. 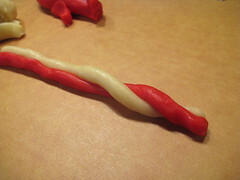 Place a piece of red next to a piece of white dough & twist them together. 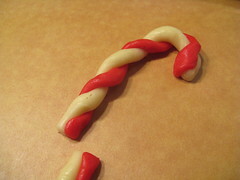 Then turn the twists into a cane shape. Place the cookies on an ungreased baking sheet & bake for 10 minutes until the bottoms begin to brown. Carefully move the cookies to a rack to cool, I find this is easier if they sit on the cookie sheet for a few minutes. I don't know if I will survive the 8 weeks of cookies. I made my mandelbrot and macaroons, I think I will concentrate on my Thanksgiving pies and cakes for the freezers! Those are so cute! I know, I remember my Grandma having so many cookie varieties at holiday time! Amazing that they really got all those cookies made back then - weeks and weeks of work, but oh so sweet! Those are super cute!! I have just started planning for what Christmas cookies I am making this year, and I may have to add these to the list. What fun cookies. Looking forward to more. How mush is A "t" of milk? 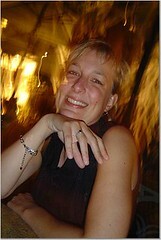 Stacey - I'll do cookies & chex mix but probably no pies or cakes so cookies aren't too much work for me. Rocio - A "T" of milk is a Tablespoon. A small "t" would be a teaspoon. these are cute, its never to early for cookies! I love the way they look! They would be a perfect addition to any cookie tray. I'm sure Santa would enjoy them, too! That's a fabulous idea! How perfect for the holidays. I have always wanted to make these! Yours look great! These always seemed mysteriously harder than they are. Do you think anyone would really care if I made them for Chanukkah? Those are so cute! I will have to give them a try. Oh these are so cute! These are going on my cookie tray this year! I made these cookies a couple years ago - they're cute, easy and a great idea for the holiday season. I did not, however, think to add peppermint flavoring! These are fantastic! you couldn't give them to a child, they would be amped up for hours on the colouring! But for an adult, with a cup of hot chocolate spiked with peppermint schnapps... Yes please! We had these at our house too. (but not peppermint flavor) Spritz cookies. That's what we called them. Yours are especially beautiful. How festive. I have neve rhad these and they look so beutiful. I am gonna try this and surprise my daughter. 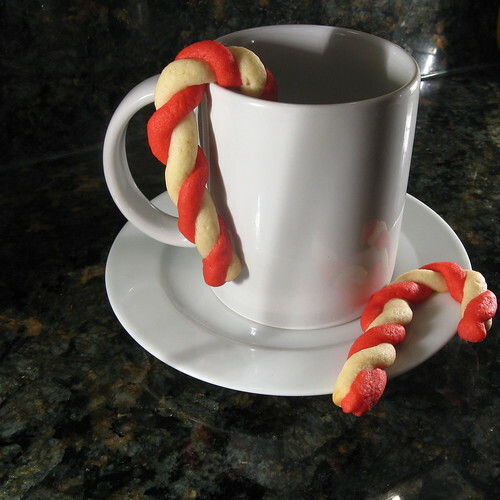 These were also my favorite cookie as a kid - I loved making the snakes and twisting them together. In addition to adding the peppermint extract to the red dough, we always added almond extract to the white dough. I am excited to make these. Just so I don't mess up the recipe...how much salt do you put in? Camara - Just a pinch of salt will do, like maybe 1/8 of a teaspoon. You want it to bring out the other flavors but not taste it. 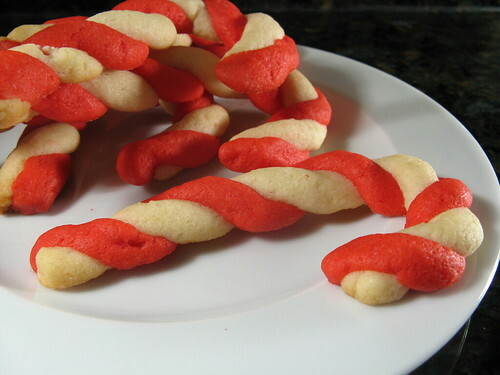 Candy cane cookies are one of my favorite Christmas cookies! My Mom always sprinkles crushed candy canes on top before baking them. They look and taste wonderful this way! I features your post today!